Goal / Objective - Each week my After School Reading Class reads and writes – and/or creates a computer­ generated presentation about a new culture, or current event topic having to do with culture. 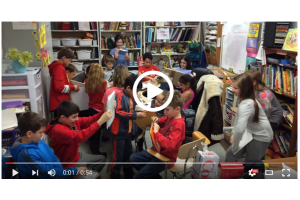 We bring in artifacts, I take them on virtual field trips (via YouTube and Skype) and they create a teaching tool about that culture, which they share with their peers, or write a piece about that text from any of a variety of perspectives. I have been volunteering in this capacity for about four years now. The class used to meet twice a week, but now meets once. Impact - Students experience other cultures while utilizing text features and comparing and contrasting cultures and identifying cause and effect relationships. In addition to using them for comprehension-related exercises, they take the books home, read them and create posters and digital storytelling projects! They love to imagine that they are taking trips around the world, via reading!